It seems like we get little geysers of Internet worry popping up every now and then about "issues" with various cameras. That seems to be amplified with the Sony models, as there certainly plenty of people that have vested interest in the DSLR duopoly that don't want to admit that the current Sony cameras have closed the gap. If you were to read the hyperbole in many Internet posts, you might be tempted to totally avoid products, particularly recent Sony mirrorless cameras. First, every camera, every system, has its pluses and minuses. There is no such thing as a "perfect" camera, so everything you see about "issues" has to be considered with that in mind. Lossy compression artifacts — These occur on all the Sony mirrorless cameras that have raw files with lossy compression (the default). Most people don't notice them. To keep file size down, Sony uses a compression scheme unlike those of Canon and Nikon, one which can produce visible artifacts at the edges of high contrast boundaries. This has to do with the manner in which Sony compresses the data. First, the 14-bit data is compressed down to an 11-bit space. This isn't where the problem comes, though. Next, the data is divided into 16-pixel chunks (on each row). The data for these chunks is again compressed, using a 7-bit value. And it's in the process of doing that you start to see issues. Basically, in chunks that don't have a lot of contrast, the compression at this stage is visually lossless. But if there's a huge differential between bright and dark pixels in that 16-pixel chunk, you can get clear artifacts. While most people don't notice them, the problem for anyone printing large can be very obvious, and it tends to occur on the edges between bright and dark boundaries, very similar to the way JPEG mosquitoes show up on the edges between detailed and non-detailed boundaries. Solution: Avoid compression artifacts by shooting uncompressed raw. File size will be considerably larger. Also: avoid things that reduce capture to 12-bits (many continuous shooting modes). PDAF striping — This typically occurs when you have light sources in the scene and the lens is producing flare. This occurs on all of the Sony mirrorless cameras, though is most visible on the latest generation A7/A9 bodies, which have more PDAF sensors in them. When it occurs, it can be highly visible, though largely only when pixel peeping or making larger prints. It's not fully known how this striping is produced, though the conjecture has to do with the way the PD photosites are created in the sensor (they have barriers that block light from certain angles so that the PD pixels are only seeing a part of the lens' output). While the stripes can be annoying when produced and you then enlarge enough to see them, most people won't see them in their shooting and reproduction. Solution: Avoid PDAF striping by avoiding lens flare conditions, particularly backlit or near-the-edge lighting on wide angle lenses. Star eating — This occurs on exposures over four seconds on all of the Sony mirrorless cameras, though Sony improved the algorithm a bit recently so it isn't as destructive as it used to be. Still, it can be a serious issue for astrophotography, not much of an issue for anything else. All the camera companies have some hidden suppression systems for dealing with the tendency of photosites to get stuck or hot on long exposures (or if overheated). Nikon used to have a star-eating algorithm that was similar to what Sony is doing, at least until I presented them with some free code from a Nikon user that did a better job. The question here is "how many stars are being suppressed?" With Sony cameras, quite a few, unfortunately. If you take a two second and four second exposure you'll notice the difference. 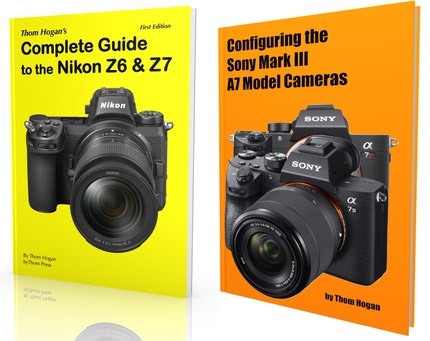 Sony made small changes to their algorithms with the most recent cameras, but the problem still is present, just at a slightly lower level than before. Solution: Counterintuitively, set continuous drive mode, plus turn off long exposure noise reduction. Shutter shock — Occurs typically at moderate shutter speeds (1/30 to 1/200), and is mostly noticeable on the A7R models and the first generation A7's. People notice reduced edge acuity. The shutters Sony originally used in the A7 series clearly had shutter shock issues. Even on a decent tripod people tended to see this problem on the original A7R the shock was so bad. It doesn't help that the Sony mirrorless cameras don't have the (damping) mass of DSLRs, either. Sony has improved their shutters since then, plus has added things like first curtain electronic shutter and full electronic shutter. Solution: Avoid by using first curtain or full electronic shutter if the camera has it, or by using shutter speeds well outside the range where the problem is most noticeable. Filter and IS damage — Cleaning a sensor—actually the filter on top of the sensor—on the Sony mirrorless cameras has had a tendency to produce problems if not done correctly. In early A7 models, the IS supports were easily broken if too much force was used in cleaning a sensor (e.g. removing dust). Sony corrected that in later models by changing the design of the IS system, but it still is important not to use excessive force on a mechanism that is used for precise positioning. More importantly, the coating on the front of the Sony filters over the sensor seems much more prone to damage than on competing cameras. In particular, the so-called gel cleaner system, which use a light adhesive to transfer dust from the filter to the cleaning pad, seem to sometimes pull up a bit of filter coating. Solution: Have someone professional clean your sensor if possible. If you do it yourself, avoid force and avoid the gel stick type cleaners. Frequency-based lighting stripes — Occurs when shooting under frequency-based lighting in the electronic shutter mode, which does not capture the entire scene instantly, but rather in pieces. Frequency-based lighting has always been an issue for photographers. With film SLR and then DSLRs the issue was changes in color between images shot under the same lighting. With the all-electronic shutter cameras the issue is that you see broad underexposed stripes typically across the long axis in your image. Solution: Same as always: shoot at the frequency of the lights. For US, that would be 1/30, 1/60, or 1/125 shutter speeds. Sensor reflections — Occurs with very high brightness objects in the scene (sun, night lighting, etc. ), and when stopped down in aperture. The intense light hitting the sensor is partially reflected back towards the lens, and you get a reflection off the rear lens element whose position will depend upon the curvature of that element. Believe it or not, we had this problem with film (reflection off the film that bounced off the rear element of the lens), but many didn't see it for quite a few reasons. In DSLRs, most of the manufacturers started altering their lenses, particularly with anti-reflective coating on the rear element of the lenses. But the short flange distance of mirrorless cameras tends to have an amplification effect, and it's still quite likely that you can see such issues in your images. Solution: use a wider aperture; some lenses are more prone to this than others, so possibly a change of lens might help, too.